Another winner! The second book in the Age of Awakening series grabbed me in the first pages. Jayden Hamilton might seem like an adrenaline junkie bent on her own destruction, but she's really a young woman with a debilitating disease trying to enjoy whatever time she has left. Her bucket list leads her to the Great Pyramid and into the underground lair of Seth Ea'nki.None too pleased with the interruption in his life of self-inflicted banishment, Seth is at first irritated and then astounded when Jayden is drawn to the oracle in his hideaway. The oracle transports them from Egypt to the paradise of Greece, where Seth's brother Ozimus Ilu'en. Ozzi is hatching a dark plan that may be tied to both the rage that led Seth to exile and Jayden's blood. Together Jayden and Seth may find the power, teh love, the will, to survive and defeat Ozzi and continue to battle against a formidable enemy Seth put away long ago.The second book in this series starts off with a bang and holds it from first page to last. It has a parallel connection with the first book, which gives insight to one of the major plot points from that book. And it brings fascinating new characters into the scene from a cuddly young daemon to a group of reptilian warriors. 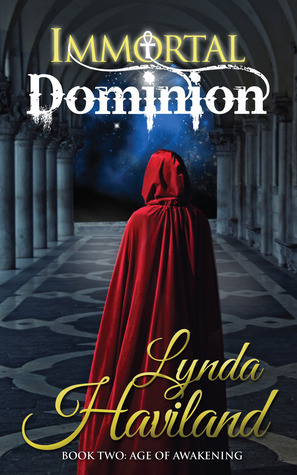 The characters a beautifully done in Immoral Dominion--a hero and heroine you can root for and bad guys you love to hate.Give me more!